Bright Futures is the name of a new program, now supported by Susila Dharma International Association (SDIA). It builds on the success of a small fundraising effort to send Herni Listiani, a graduate of Bina Cita Utama School in Kalimantan, on to higher education. The following outlines the concept and strategy for fundraising to send deserving children with potential on to higher education. The object is to allow the kids to realize their potential while positioning them for leadership, and contributing to their communities and country. These young people might not otherwise be able to go on to college (or even high school for some of them!). Bright Futures is a story-driven concept. Everyone loves a story. Everyone loves to hear about talent development against a background of challenge and adversity, the will and character to overcome and develop, and tantalizing opportunity. It’s a pretty individual approach that requires more communication than would be needed for a general fund. The test will be whether this more connected; communication-rich approach will ultimately produce a larger fund. We all know that stories about individuals really touch people’s lives. Subud members have schools in Kalimantan (BCU school), Colombia, Mexico, India, Indonesia, DRC (Dem. Republic of Congo), Nigeria and other African countries, and even in Moldova, where SDI has just organized an English Language Summer camp for disadvantaged youth. This is SD in action. The concept has two legs: a personal story and the merit of a candidate. It is an individually tailored program for individual recipients and specific groups of donors who become connected with the student they sponsor. It’s a little more work to administer but easier to market and more rewarding for donors. There are many of these kinds of great initiatives aimed at providing education to children who might otherwise experience the stunting of their potential. Bright Futures aims to do something that is a bit different, or something with a twist to it. The next section describes a model that differentiates Bright Futures from other programs. 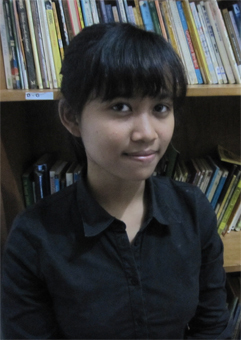 We have made a start with sending Herni Listiani and more recently, Erpan to university. Now Bright Futures must repeat the process for other students at other SDIA-supported schools. We can ask them to identify students who have coped with challenges like those that Herni overcame. We send Chandra McDonald’s story about Herni, along with a half a page or so added. That sets the scene and shows what Bright Futures is looking for. These students may have faced physical, environmental, domestic, or any other set of circumstances in which they have shown a willingness and ability to overcome. Or the candidate student may merit support through further education either because of their situation or circumstance or for some other obvious reason that would surely touch the hearts and feelings prospective donors. The school must also be convinced of the child’s potential. He or she should possess the capacity for further education through sponsorship. The question is, will the education realize the child’s potential for personal development, benefiting his/her life and the lives of their family, community, and country? It takes two: the student’s commitment matched by the donor’s commitment to the student. One last point; how many times have we looked at what seems a promising grant application only to find that the fine print excludes all but a few that just happen to fit the mold, according to the minds of the grant writers. By having a fairly open brief, Bright Futures doesn’t narrow the field simply because a student doesn’t fit a mold. Here, the story, the content, the compelling case are what count, so we leave room for the unexpected and the unpredictable. If the story is real and touches donors, they will respond. Next is the all-important story. The story is the lifeblood of the program. A writer guided from within can truly touch a reader in a unique and powerful way. Bright Futures will ask the school(s) discreetly to identify possible candidates for the program. While teachers and others associated with the school are quite likely to identify candidates, that is not always the case. Herni was identified because Chandra McDonald, herself a student, wrote an article on Herni for Subud Voice. Bright Futures invites volunteer writers to write the stories of one or more selected students who have been identified by the school or in some other manner (you never know where an initiative may arise). These invitations will be through Subud publications such as Subud Voice, Subud International Writers, Subud USA News, Subud Britain News, and similar journals, as well as through SDI Germany and other active likely organizations. The writer is as much a donor as any financial contributor and should be acknowledged as such. Each student writes a brief report/letter every six months telling about his or her life, studies, etc. (essentially the next chapter in the story). The school may offer the student help with the language and editing of these reports. The quality of the story writing is important in the context of the sponsorship model. As we build an engaging, interesting, inspiring story, and that child demonstrates the capacity and commitment to benefit from education, so Bright Futures builds its marketing material. Each report can be put up on group notice boards, along with earlier ‘chapters’ (reports, plus the original story). The idea is to build the connection with students and enthusiasm of the donors. The same material in edited form can go onto a web site. Donors can be updated through sending them website links for reports. If the reality matches the dream, two or three dozen students later might yield a great little book! Bright Futures should allow one-time lump-sum donations, annual payments for a defined number of years, and monthly payments for a defined number of months. Funds should be routed through SDI to provide solid confidence to donors. SDIA has added a website section and donation options to the Donate section of their website, showing the three payment options together with a pull-down menu of individual students for whom funds are being raised. Once a fund is ‘sold out’, its selection should flag a message indicating that student fund may be fully subscribed and offer the option to support other candidates. Each donor should fill in their contact details, if only an email address, so that a (tax) receipt can be sent. Student photos together with a synopsis are on the same or easily accessed clickable link. SDIA records the receipt of funds and the acknowledgement to donors. Bright Futures keeps a separate list for each student so that we can keep tabs on the process. I also plan to communicate directly with the donors, at least for the first few. And then I’m sure I’ll need some voluntary help! Later, maybe we can find more automated ways of communication, as long as we never lose that direct contact with the donors – because that is what works. And as a result we are currently in negotiations with two possible production partners that have close links with the BBC, Discovery and Nat Geo. If things go to plan we will start shooting the series in 2012 with the show going out on international airwaves in late 2012 or 2013! Thanks for you support and following the story. I will be sure to keep you across the developments! BORNEO PRODUCTIONS INTERNATIONAL WIN ASIAN TV AWARD. On September 8th Immanuel Bryson-Haynes from Borneo Productions International proudly received the first prize of the Superpitch as part the Annual Asian TV Awards, for their project Jungle Racer. The competition was tough with finalists travelling to Singapore from all over the Asian region including New Zealand, Malaysia, Japan, Hong Kong, Australia, Thailand and the Philippines. PT Borneo Productions International were the only representatives from Indonesia. This is a special competition for film production companies and film makers in Asia, BPI were shortlisted in the Formats category which basically is looking for new formats and concepts for TV shows. The Superpitch judges consisted of top level television professionals from around Asia including Myleeta Aga, General Manager and Creative Head of BBC World wide Productions India and Kevin Dickie, Senior Vice President, Content Group, Discovery Networks Asia-Pacific. The award was celebrated two days later at the Rungan Sari Meeting Centre and Resort, with over 60 people coming to congratulate the team. An impromptu showing of an extract of the Jungle Racer Trailer as well as some of BPI’s latest films took place and everyone agreed that it was a great party.